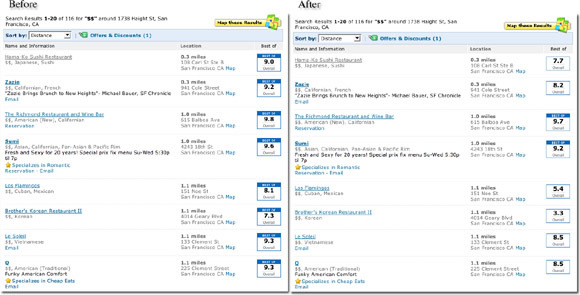 I remember when Citysearch was one of the best resources on the web for finding local restaurants and bars. For example, it was indispensible when I was getting to know Seattle several years ago. Their content database is still relatively up-to-date and the user reviews are still generally worth reading (with the standard grain of salt). However, the Citysearch ratings and the "Best Of Citysearch" label are now a complete joke. Almost every listing on this site has a "Best Of" award, and you would be hard pressed to find a place that doesn't have a score above 7.0. This was made abundantly clear when M. and I looked for a place to eat in our neighborhood last night. It seemed that just about every restaurant within 5 miles was regarded as excellent -- the average score was over 9.0. Oddly, this included more than a few that we had tried before and wouldn't recommend to anyone. Some of places that received high scores probably wouldn't even pass a health inspection, let alone merit a "9.0". Yet every last one of them was "Best Of Citysearch," no matter how awful they really were. Yes, this even includes an ordinary McDonald's, which was not only a "Best Of," but also had an overall rating of 8.5 and was "Recommended." Obviously there is some tremendous rating inflation going on at Citysearch. Which just makes it all the more amusing when you see a "Best Of Citysearch" award on a restaurant door, though I do remember when that might have meant something. Yet the relative ratings were actually rather reasonable. A restaurant that receives a 9.5 is often better than one that receives a 7.5. But scanning through the list was an exercise in frustration -- it is tremendously difficult to tell what places are even worth looking at in detail. One thing that could be done to improve this script would be to crawl the Citysearch site and capture all of the ratings. This would allow for an algorithm that could equalize the histogram of a localized subset of ratings. Even easier would be to approxmiate this by logarithmically normalizing according to some fixed constant, though an accurate model of the current distribution would still be necessary to make a good guess at the constant. (Please take a stab at this if you are mathematically inclined!) The source is available under a Creative Commons license and can be found in the unto.net SVN repository. Please add your comments here or send me a patch if you have any ideas on how to improve the Normalize Citysearch greasemonkey script. Interestingly, this process is analogous to generating the histogram of the pixel values in a greyscale image. In fact, some of the same algorithms that help with image enhancement could be used here as well. The easiest of these enhancement algorithms is a simple linear stretch of all of the values, shifting the non-existent rankings (0 through 4.5 or so) off entirely, and scaling the remaining values linearly. This is what the first version of the Normalize Citysearch greasemonkey script did. All of this said, Citysearch could consider renormalizing their own data on a nightly basis. They could easily examine the real histogram and identify any overwhelming bias. They could then use any one of these algorithms to reshape that curve to give more useful information to their users. They could even try to address some of Sean'scomments regarding the underlying user experience concerns.